Beaucoup Fit Personal Training and Performance Enhancement: Get paid to get in the best shape of your life! Get paid to get in the best shape of your life! site during that time, the greater your chance of being selected as a winner! First place male and female will win $10,000 dollars! 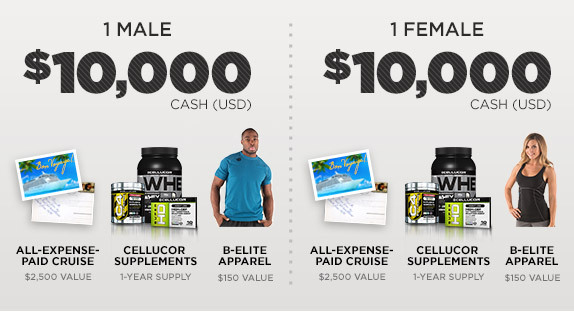 Other winners may win smaller cash prizes, supplements, apparel and/or be featured on the website. Not bad for 6 weeks of hard work and dieting if you ask me. Even if you don't win any of the prizes, just becoming healthier and more fit for yourself is the grand prize. I am thinking of entering the competition myself, if I do I will post my before and after pictures on here as well. If you join let me know, we can form a support group through this journey! Peace, blessings and happy lifting! Box Squats, something new for the arsenal.